The Cyclone is based on a revolutionary new technology that uses the rotational force of an unconventional moving-magnet system to drive a radiator directly. This new system converts low frequency signals into acoustical output without the physical limitations of conventional voice coils, cones, spiders, and surrounds. The result of this innovation is a subwoofer with ultra low distortion and 3 times the displacement of a conventional 12-inch subwoofer. Why do we need a new subwoofer? The moving voice coil subwoofer has undergone very few changes since the 1930's. Without taking into account the focus on new materials and construction techniques, today's designs still possess the same physical limitations they did 60 years ago. These limitations are evident when we call upon conventional subwoofers to properly reproduce low frequencies that are now common in modern recordings. Throughout the evolution of subwoofer design, certain compromises were necessary to overcome these physical limitations. The largest compromise involved the use of larger voice coils. Although larger voice coils increase excursion and power handling, they also add mass, lowering the efficiency. The cone and its affiliated suspension components also suffer from physical limitations in the cone's maximum allowable excursion. A fresh new approach to subwoofer design was deemed necessary in order to avoid these limitations and eliminate the compromises. How do I use it in a system? THE CONCEPT: The goal is sound quality. By that we mean sub-bass that sounds like it's coming from in front of the windshield; blends seamlessly with tight, fast mid-bass; and effortlessly reaches high volume levels. GETTING THERE: The Cyclone is best thought of as a low frequency air pump. It is most at home when used with dedicated 6.5" to 8" mid-bass drivers. How the Cyclone interacts and blends with the mid-bass drivers is the key to great sound quality. MID-BASS DRIVERS: Locate the mid-bass drivers in the front of the listening area; try the doors, kickpanel, etc. We strongly recommend having an enclosure for the mid-bass drivers and giving them all the power they can handle. In a Cyclone system, the mid-bass drivers give us our impression of SPL as well as the location of bass sounds within the listening environment. THE BOX: Many experiments have concluded that the best box is a sealed box that shows the Cyclone 2.0 to 2.5 cu.ft. Remember that the Cyclone displaces .5 cu.ft. by itself. If the Cyclone will be inside the box, make it 2.5 to 3.0 cu.ft. If the motor is out of the box, make it 2.0 to 2.5 cu.ft. For rock, rap, or most other popular music, use the smaller size box. For the ultimate in smoothness and transient response, use the larger size box. You can mount the Cyclone at any angle either in the box or with the motor exposed. Build the box as strong as possible using MDF or better material. Line the box with a few inches of polyfil or other acoustical material. THE AMP: We can't stress this enough, the Cyclone doesn't need a ton of power to do its job. That's one of the best things about it. It only needs about 150 watts continuous (300 peak) for full excursion @ 20Hz. Choose an amplifier with about 300 to 600 watts rated power bridged @ 4 ohms (remember that the Cyclone is an 8-ohm driver). THE CROSSOVER: Use only active crossovers. Never use passive crossovers with the Cyclone. Use a steep (minimum 18dB per octave) crossover between the mid-bass drivers and Cyclone. The crossover point should be no higher than 60Hz. You may even go as low as 50Hz. The idea is to make it impossible to tell where the Cyclone is physically located. The only way to do this is to keep frequencies that can be localized (above 50 - 60Hz) out of the Cyclone. 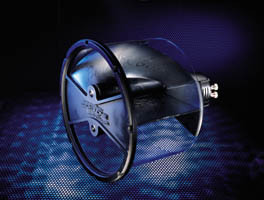 Mounting Hole Diameter 11 1/8"